(CNN) -- Hurricane Rick weakened Sunday as it churned up Pacific waters on its track to strike Mexico later in the week. A satellite image shows Hurricane Rick in the Pacific, bearing down on the southern tip of Baja California. 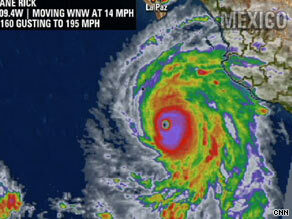 Rick remained a Category 5 hurricane with its center about 450 miles (725 km) south of Cabo San Lucas, Mexico. Hurricane force winds extended up to 60 miles (95 km) from the center. Forecast models show that Rick could make landfall on the tip of Baja California by Wednesday morning. Forecasters expect Rick to lose some of its punch as it curves northeast toward southern Baja, California, and then toward mainland Mexico later in the week, the U.S. National Hurricane Center said. The storm could be downgraded to a Category 4 hurricane later Sunday night, Robbie Berg, a hurricane specialist with the National Weather Service, told CNN Radio. Earlier Sunday, Rick's winds topped at 180 miles per hour, making it then the second-strongest hurricane in the eastern North Pacific in more than a decade. The strongest hurricane in the eastern North Pacific was Hurricane Linda that reached winds of 185 miles per hour in 1997.